X-RITE i1Display Pro + Colorchecker Passport Kit. Professional Display Calibration for the Most Demanding Color Perfectionists. The i1Display Pro is the ultimate choice for discerning photographers, designers and imaging professionals looking for the highest level of on-screen color accuracy for displays, laptops and projectors. Two user modes (Basic and Advanced) provide serious Color Perfectionists with the perfect combination of unrivaled color precision, speed, options and controls to fit any workflow. The i1Display Pro is the ultimate solution for Creative Perfectionists who demand speed, options and flexibility to attain color accuracy. Color Perfectionists know that a calibrated and profiled display is a critical element in an efficient digital workflow. Nobody wants to spend hours at their monitor perfecting images only to find that their display wasn't accurately representing their digital files. What you see on your monitor (or projector) has to match your digital file or you will never be happy with the result, no matter how much time you devote to perfecting it. In our world, perfection is not too much to ask for. Technologically advanced and ergonomic multi-functional measurement device. Next generation i1Profiler software for calibrating and profiling all modern display and projector technologies including LED & Wide Gamut LCDs. Infinite control of white point, luminance, contrast ratio, gamma and more. Multiple monitor and workgroup profiling. Intelligent Iterative Profiling - an adaptive technology that measures and analyzes the color capabilities of each unique display for increased accuracy of profile. Profile optimization - create unique patch sets for optimal results. Ambient Light Smart Control - measurement, compensation and ongoing monitoring of ambient lighting conditions. Flare Correct - measurement and compensation of display surface glare. Automatic Display Control (ADC) adjusts your display's hardware to speed up process and eliminate manual adjustments. Display quality check and trending over time. Mac OS X 10.5.8, 10.6, or 10.7 [with latest upgrades installed]. 2GB of available hard disk space. Monitor resolution of 1024 x 600 pixels or higher. Dual display support requires either 2 video cards or a dual head video card that supports dual video LUTs being loaded. DVD drive or high speed internet connection to download the software. Internet connection for software updates. User must have administrator rights to install, uninstall the application. Intel Pentium 4 or AMD Athlon XP or better CPU. Windows XP 32 bit or 64-bit, Windows Vista 32 or 64-bit, Windows 7 32 or 64-bit. Network adaptor installed and driver loaded. Internet connection required for software updates. COLORCHECKER PASSPORT Superior color results in a fraction of the time! Passport model shootColorChecker Passport is a powerful âcapture to editâ color solution for any photographer looking for more accurate, consistent color and creative flexibility. And when you combine ColorChecker Passport with AdobeÂ® Imaging solutions youâll gain even greater benefits. ColorChecker Passport combines three photographic targets into one pocket size protective, multi-positionable case that adjusts to any scene. Together with the included camera calibration software, you get the ultimate in functionality, flexibility and portability. There are so many ways to incorporate ColorChecker Passport into your Raw workflow. Whether you take advantage of the entire solution, or just a couple of ColorChecker Passportâs many features, youâll realize improved quality and productivity almost immediately. Neutralize and create your look with enhancement patches; check and evaluate shadow details or highlight clipping; check and control color shifting. Â industry standard color reference target for creating DNG profiles and for evaluating specific colors. Â create custom in-camera white balance for a consistent white point in a set of images, eliminating the need to correct each image later. Â includes both a desktop application and an AdobeÂ® LightroomÂ® Plug-In for creating custom DNG profiles. Â adjusts to accommodate multiple positions so you can adjust the targets to any scene. What's in the Box? I1Profiler profiling software for displays and projectors. PANTONE Color Manager software and Quick Start Guide. Nova Scotia, Newfoundland, PEI and New Brunswick - 15% HST. The rest of Canada - 5% GST. International Buyers - Please Note. We do not mark merchandise values below value or mark items as "gifts" - US and International government regulations prohibit such behavior. 8:30AM - 4:30PM. All times stated in Eastern Standard Time (EST GMT -05:00). 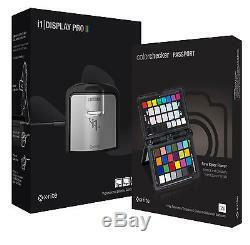 The item "X-RITE i1Display Pro + Colorchecker Passport i1 Photographers Kit EODIS3MSCCPP" is in sale since Monday, October 16, 2017. This item is in the category "Business & Industrial\Printing & Graphic Arts\Printing & Graphic Essentials\Color Guides & Pantone". The seller is "prodigital2000" and is located in Ontario. This item can be shipped worldwide.